Dave Specht will be the keynote speaker at the conference. The conference theme is “The Challenge of Change,” and workshops and presentations address business and leadership topics centric to family business. Established by a gift from the Abel family, the conference provides information useful for a variety of family businesses – from farms to restaurants and anything in between. Dr. Samantha Fairclough, associate director of the Center for Entrepreneurship, noted how the conference benefits family business in a way not being done anywhere else. Dave Specht brings his expertise to the conference as the keynote speaker. Internationally recognized for his experience in the field of family business management, he currently serves as the national development manager for family dynamics at Wells Fargo Private Bank. Known as “The Family Business Whisperer,” Specht wrote a book with the same name, which all attendees received with registration. “The conference provides a significant opportunity for Nebraska family business leaders to network with each other. By sharing their experiences at lunch or between sessions, attendees can learn to become better leaders, managers, owners and entrepreneurs, and continue the conversation after the conference,” said Fairclough. 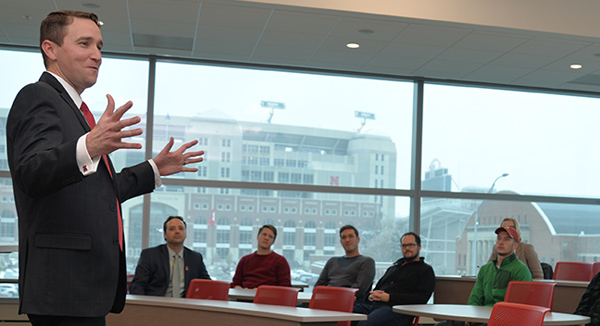 To learn more about the conference, visit: https://business.unl.edu/familybusiness.